1 Packaging requirements are at part 4 of ADR (in volume 2 of the "orange books"). The logical sequence is followed, with chapter 4.1 covering the use of packagings, intermediate bulk containers and large packagings. Each of these terms is defined in ADR at chapter 1.2. Chapters 4.2 to 4.5 cover various sorts of tanks. 2 Part 6 of ADR is complementary in that it sets out detailed requirements for the construction, and testing of packagings and tanks. 3 The initial parts of Chapter 4.1 cover all the general requirements with more detail following (the pattern throughout in ADR). 4 Once dangerous goods have been classified correctly, table A allows all the details of permitted packaging to be accessed. Columns 8 to 14 show what sort of packaging is allowed and directs you to the details. In turn, top of column 8 directs you to para 4.1.4, which gives the details of what P001 allows. A wide range of packaging types is given. 6 It can also be seen that different requirements apply according to Packing group (PG). 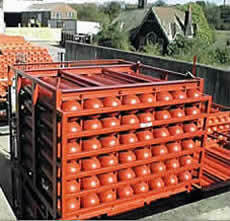 In this example, if drums are chosen as the (single) packaging, there are ten types available, all limited to 250 litres. 7 Similarly reading from columns 10 to 14 shows what tank methods are available and by reference to the relevant parts of ADR, complete details may be found. 8 That process may be adopted for all substances, care being taken to check any detailed provisions shown in other columns. In the example of the paint, there are mixed packing provisions (column 9(b)). These take you to paragraph 4.1.10. Whilst these provisions are detailed, they do allow the packer to see exactly what is and what is not permitted. The DGSA should advise the packer in this matter. 9 In most cases (the main exemption being limited quantities) packaging has to be certified to UN standards. The international agreements for the carriage of dangerous goods require packaging to be of a design-type certified by a national competent authority. This involves testing the packaging to ensure its suitability for the carriage of certain dangerous goods. Such packagings are often referred to as "type-approved" or "UN certified". Such packaging is marked in particular ways, prefixed by the UN logo and followed by codes, the details of which may be found in part 6 of ADR. 11 A number of other examples, with their interpretation, may be found in ADR at 6.1.3.11. 12 If a PG II substance is used as the example (say UN 1193) it can be seen (column 8) that an IBC option is available (IBC 02), as well as "light gauge metal packaging" (code R001). By following the relevant "packing instruction" in part 4.4.4.2 the permissible types of IBC can be found. 14 In every case all the necessary, highly prescriptive, details are to be found. 15 There are analogous processes for reconditioned packaging (e.g. there are specialist drum reconditioning firms). Drums are sometimes used on a "one trip" basis, but they may be re-used. 17 IBCs are not always maintained well. Clues such as distorted fittings, inner receptacles (bottles) that don’t seem to fit properly inside the outer (cage), or missing corner pieces indicate that there might be problems that are worth following up. It is the packer’s responsibility to ensure that packaging is compliant. 18 From 1 January 2011 IBCs will have to carry a new symbol that shows stacking capacity more clearly. See ADR 6.5.2.2.2. IBCs made before that date may continue to be used unless remanufactured or repaired in which case the new symbol will have to applied. 19 In the UK the competent authority for the certification of packaging is the Department of Transport. The testing certification scheme is operated on their behalf by their agents VCA Dangerous Goods Office, Cleeve Road, Leatherhead, Surrey, KT22 7RU. Their web site contains the details of all UK certified packaging. Similar arrangements exist in many other countries. 20 ADR contains no specific ban on the re-use of packagings. Drums are commonly re-used, but the packer or consignor needs to be sure that the drum is in a fit state and that it can be used in accordance with the conditions set out in its certificate of packaging performance. This might include reference to the type of closure. It is common for packaging as a whole (including caps and sealing elements) to be certified. Accordingly the packer should have access to the certificate and work within its limitations. Due diligence would require such a course. 21 Where drums are returned to the original packer for re-use, it would be expected that all the necessary conditions for adequate packing could be met, but other users will have more difficulty. 22 There is no objection (under this legislation) to packagings being used for substances that are not dangerous for carriage. Similarly, packagings could be used for on-site storage subject to risk assessment and requirements of other legislation. 23 Although most packaging needs to be tested and certified there are some exemptions, in particular for certain dangerous goods when carried in limited quantities. 25 Large packagings are defined in ADR 1.2.1. Although not a common packaging option across the chemical industry, the Healthcare sector uses this form of packaging on a large scale for clinical waste in the form of a “wheelie bin”, and now trolleys for the carriage of contaminated medical instruments have been certified as Large Packaging. They consist of outer packaging designed to contain inner packages or articles and which are designed for mechanical handling and to contain a net mass of 400kg or more, or are more than 450 litres in capacity. In the case of clinical waste the inner package is the familiar “yellow bag”. 26 Large Packaging specifications and testing are detailed in chapter 6.6. Details of certification are contained in 6.6.3. 27 There are several GB certifications for this type of packaging and they are used for the consignment and carriage of UN3291 Clinical Waste. The large package instruction is LP 621. This also requires that they should be leakproof. 28 The package must bear the certification mark as with other UN approved packages. Unusually the test standards for the plastic large packaging does not have the normal 5 year life span associated with most other plastics packages. Although not required to be re-tested the consignor needs to demonstrate that this form of packaging meets the UN test standard at all times. Plastics large packaging over 5 years old which has been stored outside in sunlight and subjected to regular sterilisation may not meet the UN test standard due to plastics degradation. 29 Packages of this type that do not bear the UN mark are in circulation. These do not comply with the regulations and should be taken out of use for UN 3291 dangerous goods. 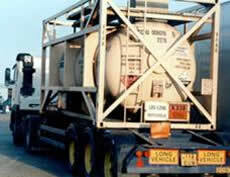 30 Tanks of various sorts are commonly used to carry bulk supplies of dangerous goods. They are widely traded internationally and for that reason the construction and inspection standards are very prescriptive. 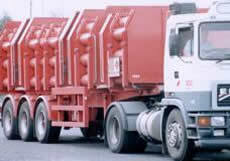 ADR 6.8 Metallic fixed tanks (tank vehicles), demountable tanks, tank containers and tank swap bodies and battery vehicles (commonly known in Britain as tube trailers and often seen with red cylinders of hydrogen) and MEGCs. ADR 6.9 Fibre reinforced plastics fixed tanks (tank vehicles), demountable tanks, tank containers and tank swap bodies. 32 Each of the terms is defined in ADR 1.2.1. Note the difference between "portable tank" and "tank container". 33 In each case there are prescriptive details of constructional standards and associated marking and certification schemes. These are operated by states' competent authorities or agencies acting on their behalf. 34 An example of how this system works is set out in Annex 6.1 below for the common case of a fixed tank (e.g. 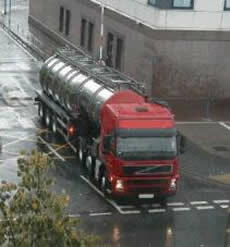 one carrying fuel on a semi trailer). 35 Because this equipment is intended to be used for many years, items may have been constructed to older standards. There are arrangements for allowing such equipment to continue in use subject to proper inspection and maintenance. In addition GB law has not always matched ADR. Accordingly "old tanks" are the subject of part of the document referred to in regulation 11(3) - "Dangerous Goods: Approved Derogations and Transitional Provisions"
36 The systems for other equipment follow similar patterns. 37 In most cases it will not be possible for an enforcement officer to check full compliance with the requirements, but there are simple checks that can be made. In practice, most owners/operators of tanks that are in regular use have them properly inspected and maintained. 38 The following checks can be carried out. Visual condition. Do the tank and its fittings appear in good order? Is there evidence of leakage? Are outlets closed with caps or blanking plates? Is the protection for tank and fittings in good order? Do temperature and pressure gauges appear to be in good order? Tank markings. There should be plates fitted which give information such as tank maker, serial number, year of manufacture, and original test data such as test pressure, working pressure, temperature limits and so on. In addition there should be a plate giving inspection and test history with dates and a mark identifying the inspection /test authority. These plates are not always easy to find and can be confused with other plates relating to the roadworthiness requirements. If there is doubt this should be recorded on the UMP form or other report given to the driver. It will be followed up by HID CI 4 on receipt of the report. 1. ADR 6.8 deals with a range of cases and for this reason is rather intricately set out. Parts of the script are in two columns. The left column deals with fixed tanks, demountable tanks and battery vehicles. The right column deals with tank containers, tank swap bodies and multi-element gas containers (MEGC - see example in annex 6.3 below). Otherwise the text is applied to all cases. 2. ADR 6.8.2.1 to 6.8.2.3 covers construction standards and related maters. This manual is not the place to look at this in detail. It is not likely that constructional standards or type approvals will be an issue in most routine inspection or related contacts. If the matter does arise specialist assistance is likely to be needed. 3. ADR 6.8.2.4 covers inspections and tests of newly constructed equipment. Follow up inspections are also covered at 6.8.2.4.2. A certificate showing the results of the tests, inspections or checks should be issued (ADR 6.8.2.4.5). 4. ADR 6.8.2.5 details how the equipment should be marked. This data should be found somewhere on the tank or its frame. In the case of trailers it may often be found on the trailer chassis, but care should be taken to distinguish this data from that related to road safety approvals. 5. There are some special requirements relating to tanks not made to recognised standards (ADR 6.8.2.7) though this is likely to be unusual. 6. ADR 6.8.3 sets out other requirements for class 2 substances (gases). 7. Inspection regimes are more likely to be an issue, though much of the sector operates satisfactorily. The requirements for routine inspections during the life of the tank are in ADR 6.8.2.4.2 to 6.8.2.4.5. For tanks the maximum interval for inspection is six years (this will usually include a hydraulic test). In addition a "leakproofness" test is needed every three years. There are slightly different requirements for tanks certain class 2 goods. More frequent inspections may be seen as the ADR figures are maximum time intervals. 8. The details of the tests should be marked on the tank or frame as para 4 above Accordingly it should be possible to follow the inspection history of a tank from its construction to the present by reference to the data fixed to it. For each inspection or test there should be a unique mark to identify the "expert" who carried out the tests and inspections. This will often be the mark of an insurance company. Annex 6.2 - Example of requirements for "old tanks"
3 Tanks are subject to a written scheme of examination"(WSE) drawn up by a competent person (analogous to that required for pressure plant). The scheme will not usually be available at the roadside, so it will not be easy to check, by reference to the marks, whether the WSE has been implemented. 4 Most written schemes will give inspection frequencies at least matching those required by ADR. Accordingly if evidence cannot be found of an inspection or test within the last three years some follow up with the owner should be made. Care should be taken as is it is not always easy to find the marks, especially if the vehicle is wet or dirty. 5 There should be a written report of the inspection and/or test . This is analogous to the certificate required under ADR 6.8.2.4.5. 6 The Energy Institute has published a model written scheme and information about training of technicians to carry out the work. CI 4B has a copy of the model WSE which HSE inspectors may consult. IBCs vary in size, shape and material of construction. All are intended for mechanical handling (usually fork lift truck). Unless specifically designed for the purpose, lifting from the top is not permissible. This is the one of the commonest way of carrying liquids, gases and some solids (powders, granules etc). Used very widely for international trading of many dangerous substances.